The EU Copyright Directive was voted through with a sizeable majority, but when it came to the question of whether to allow a vote on amendments, the motion was defeated by a margin of just five votes. If the plenary session in Strasbourg had approved the vote, there’d have been a chance to delete controversial Articles 11 and 13 from the Directive. Now that a list of how Swedish MEPs voted has been released, it looks as though there were at least two, possibly even three MEPs who voted incorrectly by pressing the wrong button. Ulvskog voted in favour of amending the Directive, even though she revealed yesterday that she wanted to adopt the Directive in its entirety. The Swedish Social Democrats have not yet replied to our request for comment. 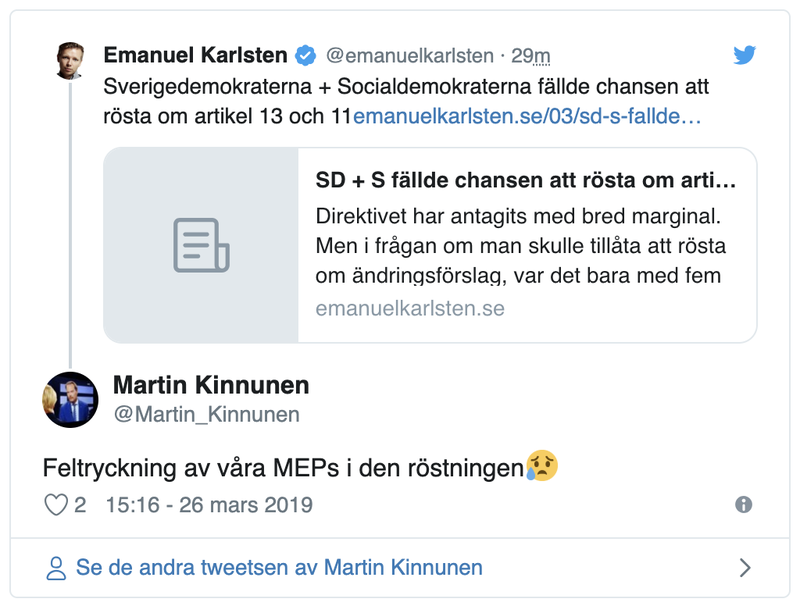 Perhaps most surprising is that Sweden Democrats Peter Lundgren and Kristina Winberg also voted against amending the Directive. Feminist Initiative MEP Soraya Post was ill, and the Moderate Party’s Anna Maria Corazza Bildt was absent during the day and did not vote. As a result, there were four Swedish MEPs who voted against the chance to amend the Directive. Had SD’s Lundgren and Wingren along with Social Democrats Ludvigsson and Guteland voted to allow a vote on amendments, Articles 11 and 13 could’ve been deleted. UPDATE: Sweden Democrats have now issued a comment on the vote. 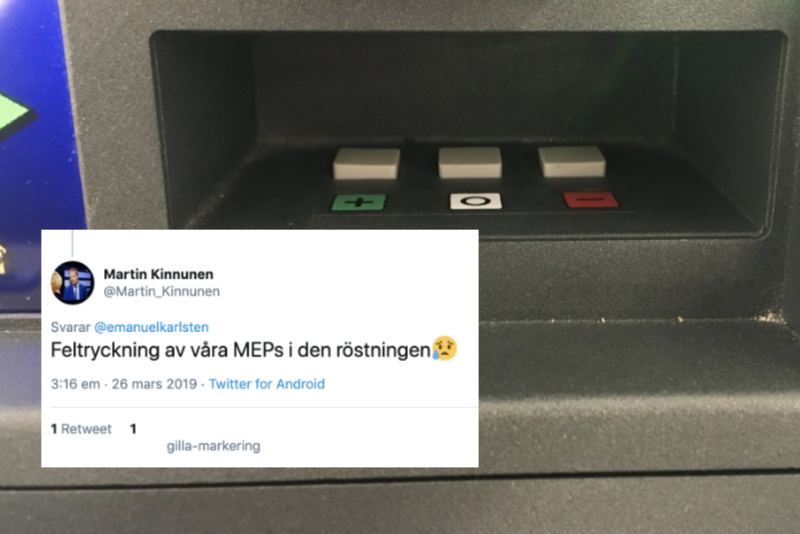 On Twitter, SD’s group leader on the EU committee of the Swedish parliament claimed that SD MEPs pressed the wrong button. SD have now announced that they’ll add to the record that they intended to vote differently, but that doesn’t change the vote itself. When it comes to voting buttons in the European Parliament, what’s pressed is pressed. Thus, Parliament was stopped by only a single vote from voting on the decision to delete Articles 11 and 13 of the Directive. One wrongly-pushed button fewer, and the result for all of Europe could’ve been very different.